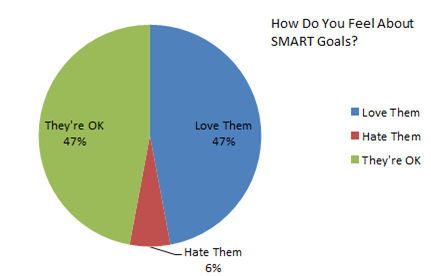 In my last post I ran a survey on Smart Goals. The data is rather interesting. Looking at the different data points, it’s clear that there is room for improvement with the SMART Goals program. After 7 days of data input, this is what I can report. 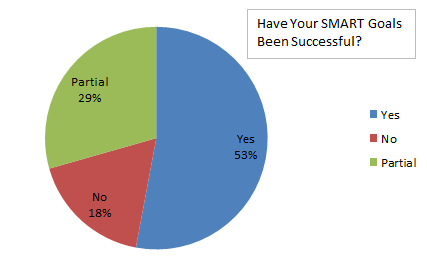 A little over half of our respondents have had success with SMART Goals, While 29% had partial success. Clearly some room for improvement. While Respondents didn’t hate SMART Goals, there is not an overwhelming love for them either. A definite area for improvement. 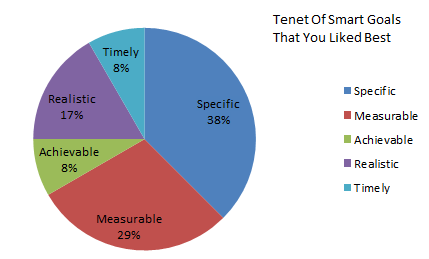 Of the five tenets, respondents liked specificity best, followed by measurability. Time measurement came in last. Clearly people liked to have a specific destination in mind. Of the five tenets that respondents did not like, achievability came in first, followed by measurability. Specificity wasn’t on the chart. 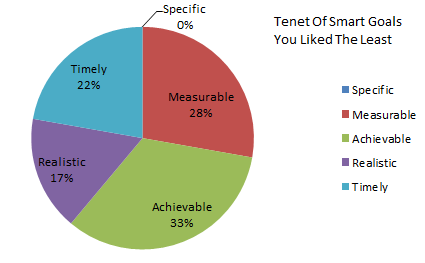 Since only half of the respondents were actually successful, achievability was a problem area. 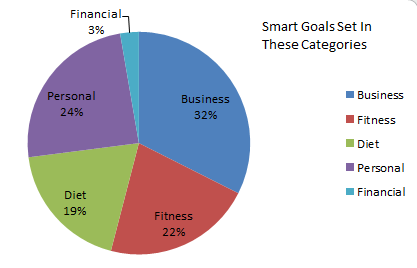 Respondents set more business goals than any other. Financial goals were the least popular. 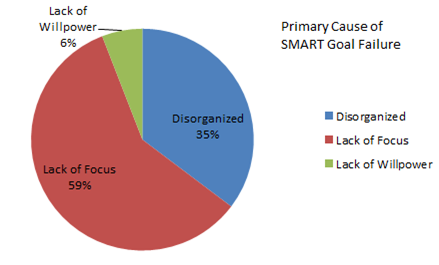 Since the SMART Goal program is greatly promoted in the workplace, this data point makes sense. 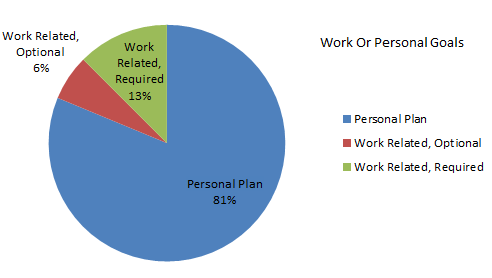 Our respondents set their own goals with a personal plan. Only 19% were setup at work. Definitely shows that most of our readers are into personal development! The biggest issue is determining what is “realistic” and “achievable” which is very difficult to do. Perhaps a look at goal recovery. I know when I have failed to meet a goal my first reaction is to give up and walk away. Perhaps there is a way to recover and reset a SMART goal. SMART always needs to lead somewhere worthy. Overall: I want to thank all of you who responded on the survey. This was my first one, and I am very pleased with the survey tools provided by Google. They work well and automatically put data into a cloud based spreadsheet. As far as the data goes, it matches my experiences with SMART Goal setting and has given me some clear data for improvement. This clearly helps when designing new goal tools and processes. It also has shown me why our Goal Setting Toolkit is so popular. This kit allows you to keep your goals front and center. A clear help with focus. Download one today.